Andropogon sorghum Brot., A. Sudanense Piper., Sorghum exigum Roshev., S. vulgare sudanense etc. Has the following local names - sudanka, sorgo sudanese, sorochinskoe millet (on Ukraine), sudanuri (in Georgia). This is an annual grassy plant. It forms 3 to 20-30 (120) stalks per bush. Stalks are cylindrical, smooth, leaf-bearing, reaching heights of 0.5-3.5 m. There are upright, slight-spreading, spreading, semi-lying and lying forms. Leaves lanceolate, smooth, light green, 45-60 cm long, 4-5 cm wide, drooping; 7-8 leaves per plant. The root system consists of many long, fibrillose roots reaching more than 2 m in length. Air roots or additional roots branch off from the bottom stem units. Inflorescence is a multi-spiked, branchy panicle 30-50 cm long originating from one-floral spiklet. 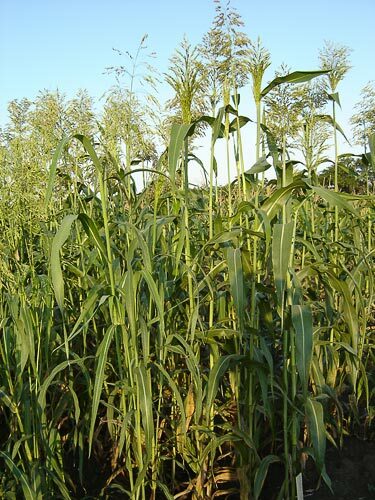 Upon maturing, the color of panicle varies from red to straw-yellow. Fruit is a weevil, enclosed in spiklet's scales. Weight of 1000 seeds is 10-15 g. Chromosome number: 2n=20. The native land for this species is the Sudan. In the wild, it is found in the valley of the Nile River. Species was brought to Russia in the beginning of the 20th century by V.V. Talanov. The basic areas of cultivation within the former USSR include the central-chernozem regions, the Middle and Lower Volga, the Northern Caucasus, Ukraine, Moldova, Kazakhstan, the Altai region, and the Far East. It is also cultivated in Bashkiria, Tatarstan, and Kazahstan, as well as in the central regions of the Nechernozem zone. This species is drought-resistant, salt-tolerant, and thermophilic, requiring high temperatures for seed germination. The best temperature for seed germination is 15-20°C. This is a short-day plant. In the beginning of vegetation, it develops slowly; intensive stalk growth begins from the moment of run out in the tube, and it stops at the end of flowering. It grows in almost all soil types, except for boggy and compressed saline soils. The plant causes intense soil dryness and nutrient depletion. Varieties include Kinel'skaja 100, Mnogootrastajuzhaja, Odesskaja 25, Zonal'skaja 6, Kamyshinskaja 51, Chernomorka, Brodskaja 2, Prialeiskaja, and Severianka. This is a fodder plant. It is cultivated for hay, silage, green forage and as a pastoral culture. Hay contains 16.4% protein and 52 fodder units (in 100 kg). It is rich in carbohydrates, proteins, amino acids (lysine, leucine etc. ), carotene, minerals, tannins, pro-vitamin A, B-vitamins, and riboflavin. It wins first place among annual cereal grasses for nutrition and productivity. Forms green mass that is harvested 30-40 days after sowing. It grows well after grazing and mowing (up to 4 hay crops per season). It is sown in mixes with annual leguminous plants. The average productivity of green mass reaches 40 tons per hectare (may reach 80 tons per hectare with watering); seeds reach 0.8-1.3 tons per hectare. Andreev N.G. 1989. Meadow and field feed-production. Moscow. Agropromizdat. 539 p.
Elsukov M.P., ed. 1967. Annual forage crops. Moscow: Kolos. 351 p.
Author. 1984. Creation of new grades and hybrids of Sorghum and a Sudan grass. Stavropol: Proceedings of Stavropol' scientific-research institute of agriculture. 147 p.
Author. 1981. Recommendations for cultivation of a Sudan grass. Tashkent: MSH Uzbekskaja SSR. 12 p.
Baranov V.D., Ustimenko G.V., ed. 1994. The world of cultural plants. The directory. Moscow: Mysl'. 381 p.
Davletshin T.Z. 1999. Culture sorghum in Tatarstan. Kazan: r.p. Alekseevskoe. 193 p.
Korenev G.V., Podgornyi P.I., Zherbak S.N. 1990. Plant growing with basis of selection and seed growing. Moscow: Agropromizdat. 574 p.
Malinovsky B.N. 1992. Sorghum in Nothern Caucasus. Rostov-na-Donu: Publisher of Rostov university. 201 p.
Nikljaev V.S., ed. 1990. Bases of agriculture and plant growing. Moscow: Agropromizdat. 478 p.
Shatilov I.S., ed. 1981. Sudan grass. Moscow: Kolos. 205 p.
Shepel' N.A. 1989. Sorghum - intensive culture. Simferopol: Tavria. 187 p.
Solovijov B.F. 1960. Sudan grass. Moscow: Sel'khozgiz. 63 p.
Zhukovskij P.M. 1971. Cultural plants and their relatives. Leningrad: Kolos. 751 p.